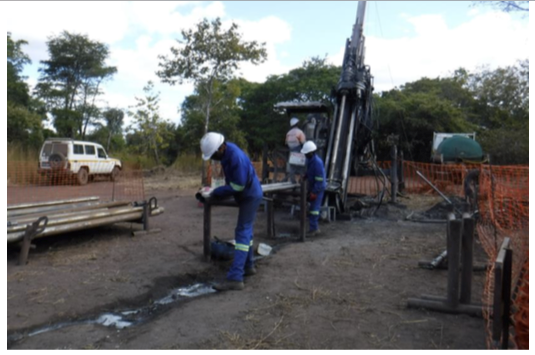 Mustang Resources Ltd (ASX:MUS | FRA:GGY) has today informed the market that the Feasibility Study drilling program is now underway at its flagship Caula Vanadium-Graphite project in Mozambique. MUS has planned 4075m of diamond and reverse-circulation (RC) drilling to be completed in the current third quarter of 2018, with a future Resource upgrade firmly in mind. 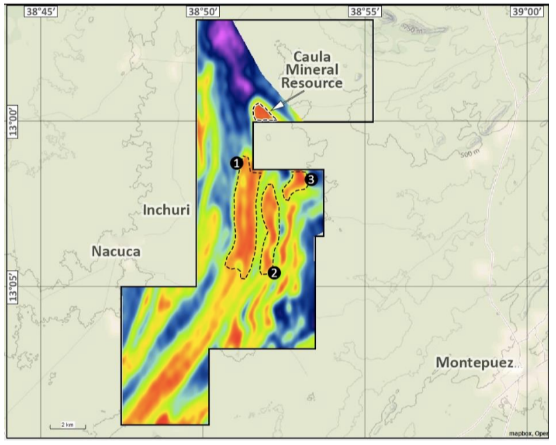 The purpose of the drilling program is not only to expand the existing Caula vanadium and graphite JORC Resource, but to provide additional core samples for feasibility level metallurgical testing programs; to conduct geological, geohydrology and geotechnical studies; and to act as a foundation for feasibility studies for the Caula project in the following two quarters. The drilling program for the Caula Project has been set out by MUS independent competent person Johan Erasmus of Sumsare Consulting, with 3025m of diamond drilling over 18 holes and 1025m of RC drilling over 16 holes. A geological office, including core logging, cutting, sampling and storage facility has also been established and camp and site construction is currently underway. Locations of Feasibility Study drill holes and the plan view of mineralisation. MUS Managing Director Dr Bernard Olivier commented on today’s announcement: “This drilling program is a significant step forward for Mustang Resources as we expect to see an expansion of the already valuable Caula Vanadium and Graphite Resources. The company believes the potential exists to expand the Caula Project significantly through the drilling program, which is in progress with independent drilling company, Major Drilling International Inc.
Feasibility Study Drilling at Caula Project, August 2018. 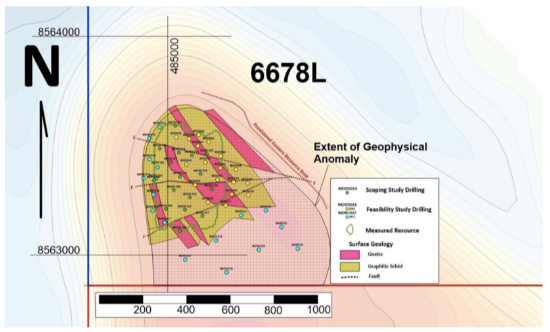 In the immediate vicinity of the Caula discovery, vanadium-graphite mineralisation has now been defined over a 540m strike length (open-ended to the south) and this mineralisation is up to 230m wide (estimated true thickness), with the depth being completely open-ended at the limit of the current drilling. The Caula Vanadium-Graphite deposit (and the deposits along strike to the South of Caula, including the Syrah Balama deposit) provide a unique opportunity to replicate the success achieved by American miners in the early 20th century, who used a simple and proven process to extract vanadium. More recently, in 2014, Syrah Resources (ASX:SYR) reported the results of vanadium recovery testwork ore from its Balama project in northern Mozambique. 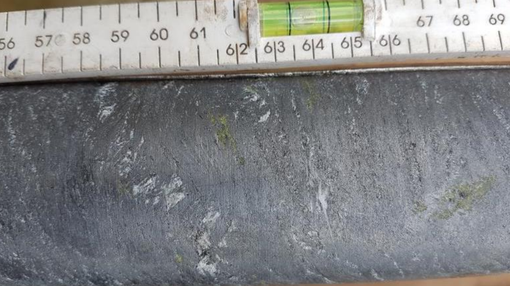 From the testwork, it was noted that that the application of Wet High Intensity Magnetic Separator (WHIMS) and mica flotation processes to the graphite flotation tailings, was effective in recovering vanadium and could achieve a combined concentrate grade of > 3% V2O5. In addition, further work showed that commercial grade vanadium pentoxide (98% and 99.9% purity), which is suitable for battery use, can be produced from this vanadium concentrate. MUS metallurgical testwork conducted to date at Independent Metallurgical Operations Pty Ltd and Nagrom, both located in WA, has shown that the vanadium reports to the tailings during the graphite flotation process. Vanadium recovery testwork on the flotation tailings demonstrated that a portion of the vanadium could be recovered and concentrated using WHIMS. The testwork also showed that additional vanadium could be recovered from the WHIMS tailings by a froth flotation procedure, aimed at recovering and concentrating micaceous minerals including roscoelite. Ongoing testwork is underway.